Australia is one of the biggest markets for diesel genset in the Asia-Pacific region, driven by the demand from the mining sector coupled with growing hospitality and service sectors. Though, mining sector declined in last few years, but is expected to recover in the forecast period, which would spur the market for diesel gensets in the country. According to 6Wresearch, Australia diesel genset market is projected to touch $765.4 million by 2022. In Australia, diesel genset market, genset with rating more than 750 KVA accounted for majority of the market revenue share due to their extensive usage. In the forecast period, diesel genset with 5-75 KVA range would continue to dominate in terms of volume in Australia. The regional share of diesel genset market is dominated by Queensland in Australia. Queensland dominates the regional share due to the presence of huge mining industry. 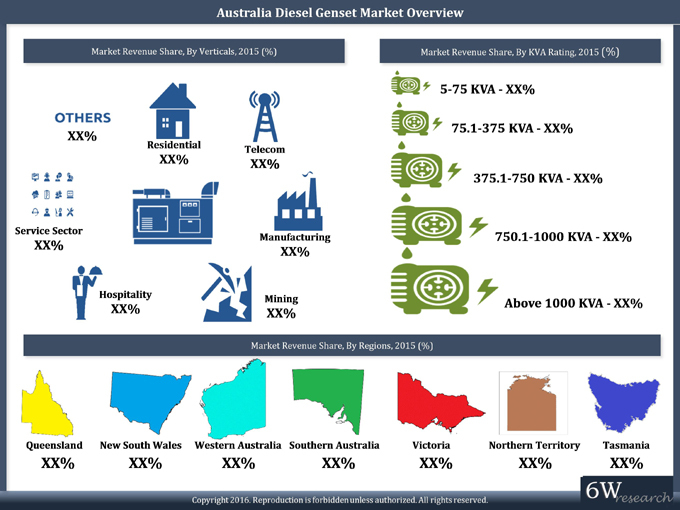 The report thoroughly covers Australia Diesel Genset market by KVA ratings, verticals and regions. The report provides the unbiased and detailed analysis of the on-going trends, opportunities / high growth areas, market drivers which would help the stakeholders to device and align their market strategies according to the current and future market dynamics. • Market Size & Forecast of Global Diesel Genset Market Revenues and Volume until 2022. • Historical Data of Australia Diesel Genset Market Revenues and Volume for the Period 2010-2015. 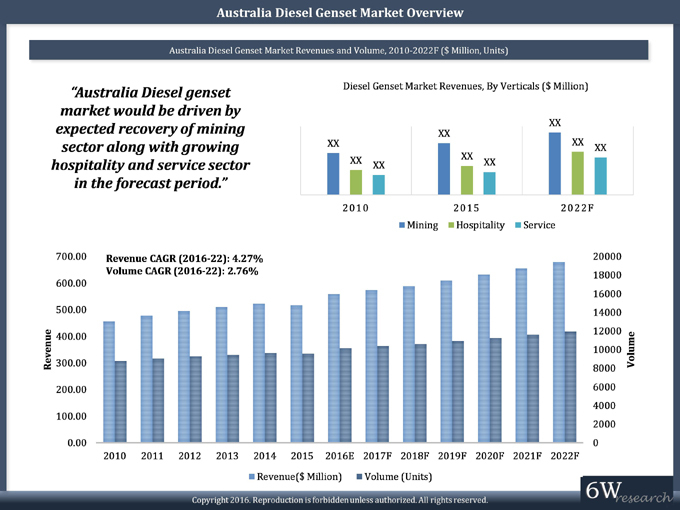 • Market Size & Forecast of Australia Diesel Genset Market Revenues and Volume until 2022. • Historical Data of Australia Diesel Genset Market Revenues by KVA Rating for the Period 2010-2015. • Market Size & Forecast of Australia Diesel Genset Market Revenues by KVA Rating until 2022. • Historical Data of Australia Diesel Genset Market Volume by KVA Rating for the Period 2010-2015. • Market Size & Forecast of Australia Diesel Genset Market Volume by KVA Rating until 2022. • Historical Data of Australia Diesel Genset Market Revenues by Verticals for the Period 2010-2015. • Market Size & Forecast of Australia Diesel Genset Market Revenues by Verticals until 2022. • Historical Data of Australia Diesel Genset Market Revenues by KVA Ratings by Verticals for the Period 2010-2015. • Market Size & Forecast of Australia Diesel Genset Market Revenues by KVA Ratings by Verticals until 2022. • Historical Data of Australia Diesel genset Market Revenues by Regions for the Period 2010-2015. • Market Size & Forecast of Australia Diesel genset Market Revenues by Regions until 2022. 17.8	MTU Onsite Energy Corp.